Have you been missing the pop/punk sound of the 80s? 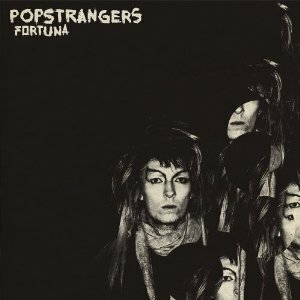 Then Popstrangers’ latest album, Fortuna, is just what you need in your life. Popstrangers is Joel Flyger, Adam Page and David Larson – native New Zealanders who were playing hard-driving noise punk, but they decided they needed some big changes. They packed up and moved to London, and they also decided to make a change in their style of music. Fortuna is their second full-length album, and while it’s still full of driven melodies, the hard noise punk is gone – at least for now – and it’s been replaced by an atmosphere far more austere and off-kilter. “Distress” and “Country Kills” are upbeat pop tunes that brings The Clash to mind, while “Sandstorm” and “What’s On Your Mind?” are mellow and dreamy psych-pop – and rather reminiscent of The Cure. If you’d like a little throwback sound mixed in with new songs and a slightly punk edge, Fortuna by Popstrangers is for you.